Thanks to reader Bill for the photo! When these two teams met earlier this year, the teams played a very close game on Friday night and Michigan clung to a single-goal lead late in regulation, couldn't hold the lead and the Buckeyes won in overtime. The next night, Michigan unleashed a barrage of shots on Cal Heeter. He turned away most of them, but Michigan prevailed 2-1. 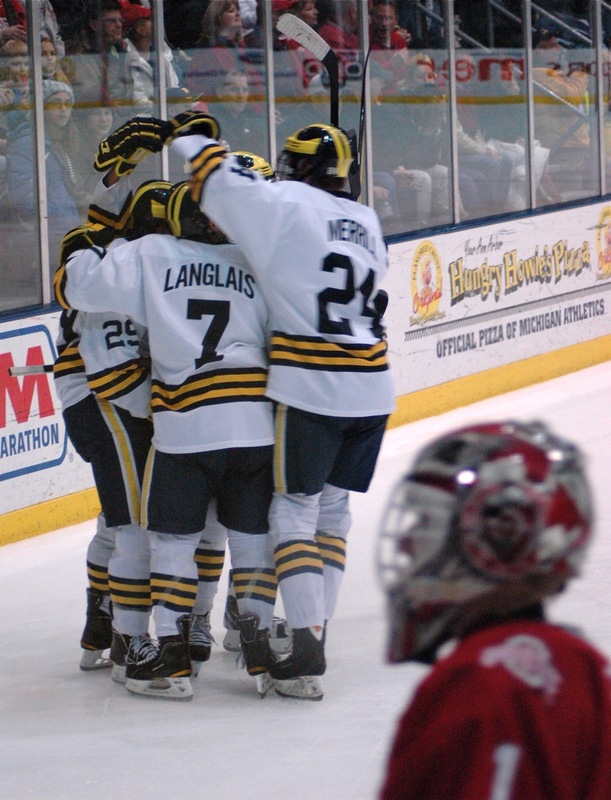 The scenario was very similar this weekend, only during the Friday night game Shawn Hunwick turned aside some late Buckeye chances leading Michigan to the win. Michigan came out with their completely revamped lines, and they didn't appear to help during the first period of Friday night's contest. The Wolverines had a whole 5 shots on goal in the first period and were fairly significantly outplayed. Hunwick made a couple of great stops--his best was on Dries after he walked in all alone and tried to backhand one top shelf--and the first period ended 0-0. Michigan did end up with a couple of scoring chances. AJ Treais got in behind the defense and shot high, a great pass by Pateryn (high off the glass from his own zone) sprung Rust on a breakaway and he hit the crossbar, and Chris Brown fed Caporusso late in the period. Still, it was a fairly lifeless first stanza, especially for a home game. Early in the second, Luke Glendening intercepted a pass at center ice, gave it to Scooter Vaughan just over the blueline, and Vaughan put a twisted wrister past Heeter into the top of the net to give Michigan a 1-0 lead. That was Vaughan's 10th of his impressive senior campaign. AJ Treais nearly made it 2-0 on a wraparound but Heeter got his pad down. Then the Wolverines got a little fortunate. Hunwick bailed out his defense on a bad turnover, and then Burlon made an even worse turnover that would've led to a Buckeye breakaway but for an offside call. Chris Brown then came close. Michigan was cycling in the offensive end and Langlais slid a shot off Heeter's pads. The rebound came to Brown and he had nothing but net to shoot at, but the defenseman was just able to get a stick on Brown's shot to deflect it up into the crowd. Sergio Somma made it 1-1 off a feed from Albert. He went 5-hole and it just snuck through Hunwick. Ohio State nearly got on the board again not too much later but Hunwick made a good save on Toy who put a shot through traffic. After the second period it was 1-1. Just as Ohio State was probably disappointed to be tied after the first period, Michigan was probably disappointed to be in a tie game after the second period they played. Early in the third, Chad Langlais broke up his second 2-on-1 of the night. This time he had gotten caught, but busted it to get back and just got enough of the Buckeye player to prevent a shot--and didn't get called for a penalty in the process. Chris Brown then made it 2-1. Michigan came out on a 4-on-2, Hagelin sent a cross-ice pass to Brown and he put one through Heeter from about 60-feet out. That was really not a good goal to give up, but one that Chris Brown and the Wolverines really needed. Caporusso then added to the lead on what looked like it was going to be a nothing play. Michigan was kind of stumbling around in the offensive zone and Rust --> Glendening --> Hagelin --> Cappy and he put one up top that I don't think Heeter ever saw. Hunwick made a ridiculous stop to bail out Langlais on an awful turnover. Michigan won a faceoff and it looked like Chad just centered it right to an OSU player. Hunwick got the glove up to keep Michigan ahead by a pair of goals. OSU followed that up with their best shift of the hockey game, and a couple minutes later they were finally rewarded after Michigan went a little Keystone Kops in the neutral zone. Lynch took a guy down, Pateryn came way out to try to corral the loose puck and ran into his own guy. Lynch took another guy down but the puck got through to Boyd. Bennett was in no man's land, and Pateryn got back just in time to haul the guy down as he scored. Yes, we somehow gave up a goal on a partial breakaway when we had 4 guys within 10 feet of our own blueline. And we managed to take a penalty on the play, so OSU got a power play as well. They had a good amount of possession on the subsequent power play, but no great chances. Red mentioned that Michigan got a little cute and this was one of the plays: Caporusso was coming right down Main Street (or should that be State Street?) and instead of shooting dished off to Hagelin by the goalie's left. Hagelin tried to dangle around the goalie and then wrapped it around instead, but a defenseman was there to prevent any shot. OSU pulled the goalie very early on and got a couple of chances, but Dries hit Hunwick in the head with one shot, shot high on another, and Rust and Hagelin both had nice backchecks in the waning seconds to help keep OSU from sending another game to OT late. Photo: Bill again. "It's all your fault!" Saturday night was a much better performance right out of the gate. Glendening had two great chances on his first shift of the hockey game and Langlais had a good rush up ice. Hunwick was big early as well. Pateryn pinched up and didn't get the puck, which led to a 2-on-1. Hunwick made a glove save and didn't give up a rebound. Brown had a couple of good chances and Langlais saved a goal by tying up Somma. The Wolverines took a 1-0 lead on an end-to-end rush by AJ Treais that led to a beautiful pass over to Moffatt who put a vicious backhand across the net up under the bar. Glendening then hit the post off a good feed from Scooter. Hagelin shot high on a short-handed 3-on-1, which led to a 3-on-1 the other way, but Langlais dove and broke it up. Heeter then made a huge stop on his own man. Rust had a break and didn't get a shot away as he kind of fumbled the puck. The OSU defenseman was trying to clear it to the corner but ended up putting a pretty good shot right on net. Heeter had to be quick with the pad. Early in the second, Hagelin made as pretty of a pass as you'll see all year to hit Chris Brown for a beautiful tip-in to make it 2-0. Heeter then made a couple more saves to keep it a 2-goal hockey game, none better than stoning Matt Rust off a great pass from Glendening. Michigan went to a power play with a chance to go up by 3. They won the draw but Burlon didn't quite get to it. That led to a breakaway for Schneider from his own blueline and he roofed one over Hunwick to make it a 2-1 game. Hunwick stopped Somma to keep from giving up two SHGs on the same power play, and then he made two HUGE stops on Dries as everyone was piling into the net. In the third, Chris Brown drilled a guy from behind and got tossed. He got away with a minor the night before, but this one was an obvious major. The Wolverines killed the penalty with only one great chance for each team. Hunwick made a save on a deflecting puck and then somehow got his left toe on the rebound. I don't think he ever saw it, but he was just tall enough to keep it out. Then Winnett ended up with a breakaway from his own blueline and got stopped. 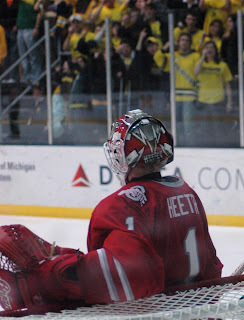 Glendening and Winnett had other chances that Heeter stopped. OSU pulled the goalie fairly early on again and Hunwick had a big save on Somma and that was all she wrote. Michigan gets the sweep. It wasn't a pretty sweep by any stretch of the imagination. The Wolverines still only scored 5 goals on the weekend, but Caporusso, Brown (2), and Moffatt all needed goals and they all got em. 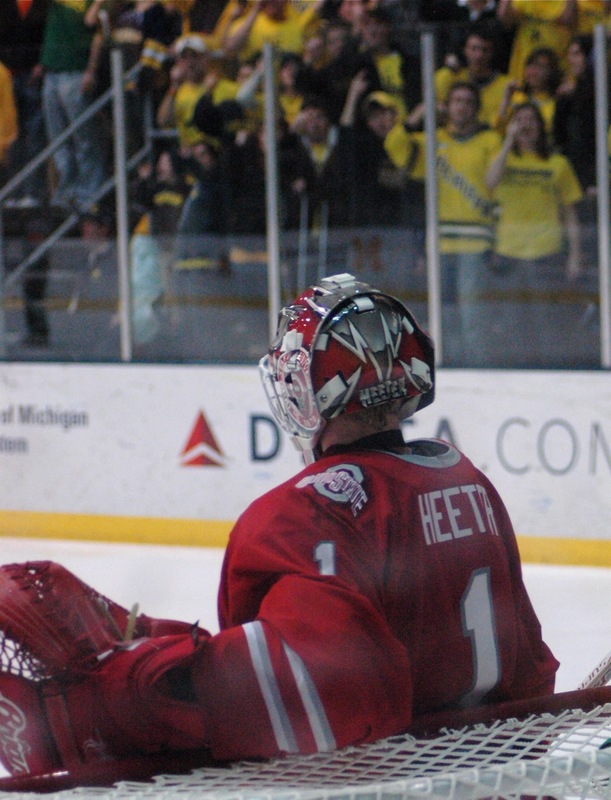 I thought Michigan probably got away with a better result than they maybe deserved on Friday night, but Saturday should have been a 3 or 4 goal win, and Heeter kept the Buckeyes in it. What about the new lines? I liked them a lot. Hagelin, Brown, and Caporusso's line accounted for three goals and had a slew of chances. I'd like to see Louie get a little more selfish. He dished off at least 4 this weekend where he had pretty darn good scoring chances on his own. He did get his first GWG on the season, though, and hopefully that gets him going for the stretch run. Brown was great this weekend when he wasn't in the box/locker room. It was the first time in awhile we've seen the type of play that he regularly showed at World Juniors. Rust, Glendening, and Vaughan was a great line as well. Vaughan scored, and Rust and Glendening probably combined for 8-10 great chances on the weekend. Right now, it doesn't seem like either of them could score in a whorehouse with $100 sticking out of their zippers, but they're getting a ton of chances and eventually the goals are going to come. That's a great defensive line as well. The USA line (Treais, Wohlberg, and Moffatt) was pretty good as well. Treais is starting to turn into a really nice player. He's showing enough flashes that it doesn't sound all that bad to have him as a number one center next year. That Moffatt goal was sick. Even the fourth line did some good things. DeBlois saved a goal with a backcheck on Saturday, Winnett had three or four great chances when he moved up to the top line with Brown ejected. All in all, it probably wasn't the goal production they were looking for, but all four lines played well, three of the lines scored goals, and three lines produced fairly consistent scoring chances. Hagelin/Brown and Rust/Glendening had something working all weekend. I'm starting to think that you could make a damn fine case for Shawn Hunwick as the first team All-CCHA goalie. He's third in wins, despite playing 7 fewer games than Pat Nagle and three fewer than Mike Johnson. He's second in GAA to Connor Knapp, second in save percentage to Will Yanakeff (who has only played in 9 games), and tied for first in shutouts. I could see giving it to Nagle as he's put up killer numbers and has barely gotten two goals per game of support, but Hunwick has been really fantastic for the Wolverines after a slow start (and it's not like we've given him a ton of goals lately either). It's amazing that it took almost 3 years before anyone realized he was capable of playing at the collegiate level--and even as good as he was last season, he was slated to be the #3 goalie this year if Jack Campbell didn't go to the OHL. Pretty amazing. Michigan and Notre Dame each gained six points on the weekend. Miami lost in a shootout Friday night to Western Michigan, so the Irish sit one point ahead of both the Wolverines and RedHawks. Both teams have two games in hand on Miami, which they'll make up on the idle RedHawks this weekend. Michigan has WMU and Notre Dame travels to Ferris State. I don't know how bad Brown's hit really was- being that I am at the opposite end of the ice-I talked to him after the game and he was clearly upset. Wilkins made that call from OUR blueline with his partner ten feet away from it. Maybe a CFB, but not 5:00 major, especially after that buffoon let that kneeing of Brown go. I guess I don't know what the standard for five and a game is in college hockey any more. They've gotten more lax from a few years ago when any hit from behind was five and a game. I didn't have a problem with him getting tossed, though you're right, they blew the call on him getting kneed. And #5 on OSU absolutely plowed one of our guys from behind (Hagelin I think) pretty early in Friday's game. No call, and a pretty obvious penalty right by the puck. I still say you can't put your team in a position they call it a major. I like the way Brown played this week, but you can't depend on these goods to not toss you if you give them a chance. Even if it's a minor, 2 hfb penalties in 2 games is too many. Yep, I know, he agreed that he's got to be more careful. I think this was a case where his size and the perception of the hit had more to do with the call than the severity of it. He did say, though, that Reed apologized to him at the next faceoff for the kneeing. Reed is a careless tool out there, could have been sent off a half dozen times. The defense is getting shook up this week- apparently Pateryn is being paired with Burlon, leaving Moffie/Bennett/Clare to be matched up for the third rotation. I think they are having more issues than Brown. FYI - Your rink was labeled best fans, by the Wall Street Journal.